In the ultimate guide to e-commerce statistics of Southeast Asia published last year, we look into key statistics on why Southeast Asia is a hotbed for e-commerce. 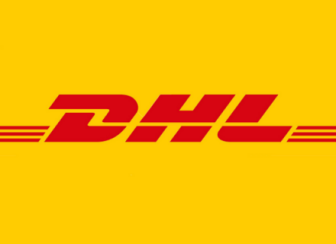 UBS has recently released an interesting research (reported via FT) that brings us some new perspectives on why Southeast Asia provides so much opportunities for e-commerce, at the same time becoming competitive in key markets. We break those data-points into 20 facts you shouldn't miss on understanding e-commerce in Southeast Asia. #1. There are close to 620 million population in Southeast Asia, almost half of China and double of US. #2. Mobile penetration rate in Southeast Asia is 112% (excluding Brunei, Myanmar, East Timor). #3. Current Internet penetration in Southeast Asia is 32%, which means there are almost 200 million Internet users in Southeast Asia. #4. Singapore has the highest % of online population at 74.0%, followed by Malaysia at 62.6% and Thailand at 46.0% (which is similar with China). #5. Indonesia has the most Facebook users at 65 million, followed by Philippines at 36 million and Thailand at 26 million. #6. Indonesia has the highest retail sales at US$100.2 billion, followed closely by Malaysia at US$98.2 billion and Thailand at US$94.4 billion. #7. Total retails sales of US$436 billion in "big 6" Southeast Asia countries is only 11.4% of China and 14.4% of US. #8. Singapore has the highest e-commerce penetration (e-commerce % of retail) at 1.0%, followed by Philippines at 0.3% and Malaysia, Thailand both at 0.2%. #9. Average e-commerce penetration of "big 6" Southeast Asia countries is only 0.2%, way behind China at 8.0% and US at 8.7%. #10. Indonesia has the biggest e-commerce growth potential followed by Malaysia and Thailand, if all countries are to achieve 5% or 8% e-commerce penetration rate. #11. In B2C marketplaces segment, Amazon is the most visited website in Indonesia and Philippines, #2 in Singapore, #3 in Malaysia and #5 in Thailand. #12. eBay is #1 in Singapore, #2 in Indonesia, Philippines, Malaysia, #3 in Thailand. #13. Rakuten is #2 in Thailand, #5 in Indonesia, Malaysia and Singapore. #14. In B2C multi-brand retailers segment, Lazada is the most visited website in Thailand, Indonesia, Philippines, Malaysia. #15. Zalora is #1 in Singapore, #2 in Philippines and Malaysia, #3 in Indonesia. Read also: Do Malaysia and Indonesia have enough products listed as compared to major online marketplaces in the world? #16. In B2C private sales & daily deals segment, Groupon is the most visited website in Singapore, Thailand and Indonesia. Groupon should be leading in Malaysia too as contrary to the chart above. #17. LivingSocial is #1 in Thailand (Ensogo), #2 in Indonesia, Philippines (Ensogo) and presumably Malaysia. #18. In C2C marketplaces & classifieds segment, every markets in Southeast Asia are led by different sites as there is no dominant global or regional player in this arena. #19. Taobao is seeing some traction in Chinese-populated countries with #1 in Singapore and #2 in Malaysia. #20. 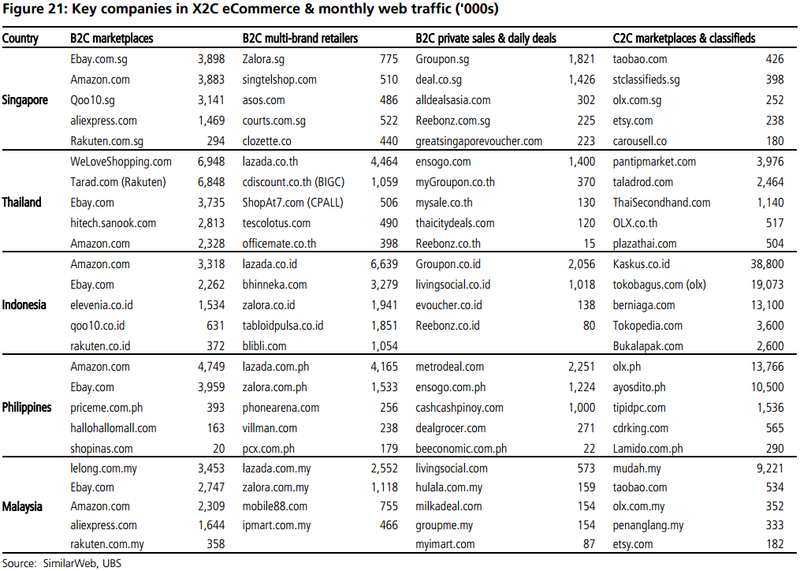 Naspers-owned OLX is featured prominently in top 5 of all Southeast Asia markets above. Bonus: UBS estimates e-commerce conversion rate for Southeast Asia ranges from 0.5% to 1.0%, not far off the global average of 1.2% (US at 3%).